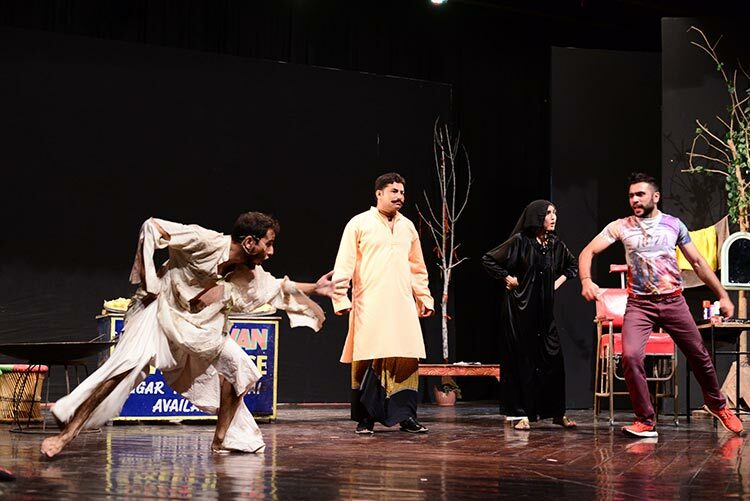 LAHORE: Ajoka Theatre performed a thought-provoking Punjabi play “Marya Hoya Kutta” at the Alhamra Drama Festival organised by Lahore Arts Council on Saturday evening. Directed by Nirvaan Nadeem, the play was a multi-layered comment on modern day society. The story presents a scathing critique of cultural narratives, norms and practices, in a humorous but meaningful way. The audience thoroughly enjoyed the play and gave out a standing ovation to the young performers. Written by Ajoka Executive Director Shahid Mehmood Nadeem, the play featured with bright young actors selected from Ajoka’s pioneering “Acting Master Class” held a few weeks ago in Lahore. The play opened with a dead dog lying in the middle of the road causing inconvenience to the people of a neighbourhood, none of whom are ready to remove it. They carry on with their petty squabbles and routine activities hoping that someone will rid them of this problem. At night they all go to sleep but wake up due to an unbearable stench. They discover the body of the dead dog has mysteriously disappeared but not the stench. Everyone then starts accusing each other of being the source of the odour. All the actors performed their roles brilliantly and received an overwhelming response. Veteran Actor Naeem Tahir encouraged the young talented performers and especially praised the director. While giving his remarks he said the production reflected the efforts and dedication that Nirvaan had put in to make the play a rich mix of enjoyable and thought-provoking socially relevant content.